Wisconsin Wolf Hunt, a community site for wolf hunting enthusiasts to learn and share information, pictures and stories. Wisconsin Wolf Hunt .com aims to help preserve the Wisconsin Wolf Hunt and our heritage through education and advocacy. In response to a lawsuit brought against the United States Fish and Wildlife Service, the Federal District Court for the District of Columbia has vacated a 2012 decision, which delisted wolves as an endangered species. This decision returns wolves in the Great Lakes Region, including Wisconsin, to the Federal Endangered Species List. Wisconsin Department of Natural Resources and Department of Justice legal staff are reviewing the decision to determine how it will impact Wisconsin's wolf management program. Further information will be available following this review. Permits which allow lethal removal of wolves issued to landowners experiencing wolf conflicts are no longer valid. The department will contact permit holders to alert them. The department is not authorized to use lethal control as part of its conflict management program. Non-lethal tools and depredation compensation remain available. Those experiencing conflicts with wolves should contact the United States Department of Agriculture - Wildlife Service for conflict investigation and management assistance. 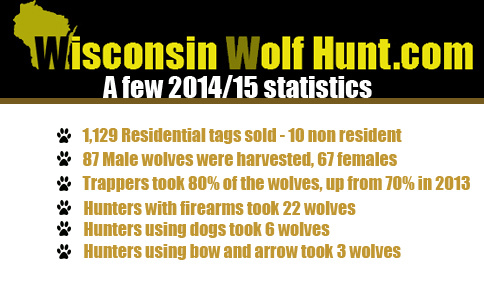 USDA Wildlife Services can be reached at 800-228-1368 in northern Wisconsin or 800-433-0663 in southern Wisconsin. Wisconsin's law allowing landowners or occupants of the land to shoot wolves that are in the act of depredating domestic animals on private property is no longer in force. Landowners may not kill wolves in the act of attacking domestic animals. Under Federal Law, you cannot use dogs to track and train on wolves. Wisconsin is not authorized to implement a wolf harvest season. While the department is disappointed by this decision, we will continue to support USFWS and their original decision to delist and remain confident in the State of Wisconsin's ability to manage our wolf population.